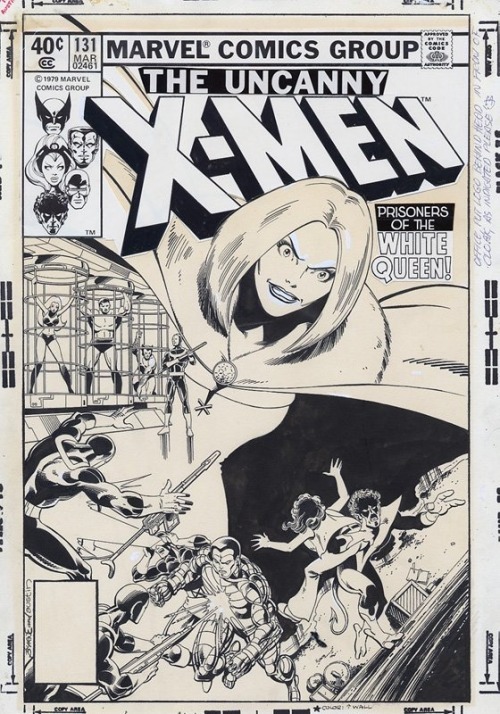 John Byrne's cover to Uncanny X-Men #131 shows key moments from the issue with the White Queen superimposed over the top. A picture truly speaks a thousand words and Byrne grew increasingly adept at this type of montage during his definitive run on the X-Men. The pencils and inks of the original art really show the magic of the John Byrne-Terry Austin teamwork that was a hallmark of this incredible period in the X-Men's history. The note in the right margin reads "Office, Put Logo Behind Head In Front Of Cloak, As Indicated Please."